Another great template that you can put to use NOW! This article template capitalizes on the fact that your readers can mentally plug themselves into any one of these stages and in so doing can easily identify with content that is of interest or appropriate to them. In the case of painful subjects, like unhealthy debt, your article can guide the reader through the steps of escaping the negative impact of a particular stage. In the case of more enjoyable pursuits, like yoga, your article can give the reader a road map to the next stage of proficiency. Find a topic in your niche that can be easily broken down into (3) levels of severity and give each stage a label. Important: Only list (1) stage per article – but you can list multiple examples and methods within each article. The first paragraph or two outlines the (3) stages and clearly defines the attributes of the particular stage explained in the article. In the next paragraph, relate to the reader’s current stage and reassure them many others are currently at this particular stage. Provide examples of how others have escaped this stage or graduated to a more desirable stage using your methods. Give the reader clear directions to either escape the stage they’re currently in or to achieve a more desirable stage. Once you have shown the reader the path(s) to their desired outcome, explain how they can maintain their new status. Conclude with a quick summary of the (3) stages as you defined them, your method(s) for improvement and how the reader will benefit by following your advice. 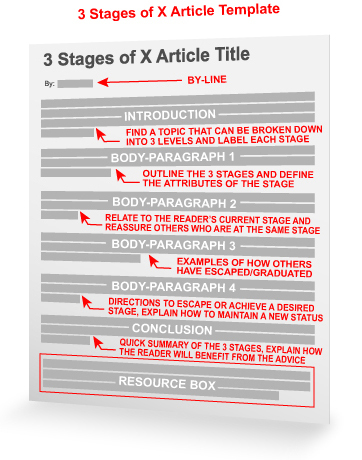 By using this template you should be able to write at least (3) articles on each of the stages of “X” you discover within your niche. Find (5) topics that fit this template and your efforts will generate (15) new traffic-driving articles! Better yet, it’s surprisingly easy. Once you find these topics and outline the stages, you’ll be amazed at how these articles will virtually write themselves. Excellent idea to use templates. It is also a better read because the article makes more sense and it guides the reader through the article. 3) The last paragraph should be a summary, conclusion and call to action part. Repeat what the reader did learn and tell him what to do next (for example downloading your free report etc). Great Idea! I can use this for articles, and blog posts also. It strikes me that your template also works for writing web copy, with some modification of course. You will want to include all stages in the web copy, but you’d have some powerful copy if by clearly delineating the issue and solutions, as you explain, and providing the examples etc. (preferably with testimonials). Effective web copy nowadays is much more like editorial writing than the super-hyped sales copy that everyone still seems to think works. Wonderful. I use templates for a lot of my writing that I’ve made up over the years. Yours is excellent! Love it! Thank you. Excellent template to discover new article ideas. Thank you! Good stuff, I try to use a similar format myself. Helps make laying out articles easier. This is great advice and an excellent article. Thanks for the suggestion. I plan to use it soon. Thank you for this wonderful template. This is a spectacularly on-target and useful idea and article. Like many of your posts, it’s becomes immediately obvious after you read it. Your blog is a definite read. I had noticed that many of my clients then would begin to get anxious about the coming work week on Sunday evening. So I coined the term Sunday Night Syndrome and broke it into mild, moderate and severe. I sent it into my editor and they sent it out on the newspaper wire. Now remember, this is ’95, before an article could go viral in less than an hour on the ‘Net. About 5 – 10 days later I begin to get phone calls and letters about the column, asking me where I had done my research and did I have a book out yet on this subject. This one slam dunk works!! Impressive very impressive. I definitely will use this template for my articles.